Imagine you are a manager and as you are walking through the office, you overhear two employees talking. They have never heard of a Shred All Policy, and as such, a conversation begins with one employee asking the other if the piece of paper that she is currently holding needs to be shredded. After a 20 second exchange about what information is contained within the document and whether that information is confidential, they both decide that the document can be thrown away even though it has a client’s name, address, and phone number. Without intervention from you as a manager or a more well-informed employee, these two employees would most likely continue this costly practice for the rest of their time at your organization. This is where a Shred All Policy can play an integral role in your company’s handling of all paperwork. From the moment when documents are created until the time they become redundant, obsolete, or trivial there should be one primary goal in the handling of that information, and that is to protect it. A Shred All Policy for your business outlines to employees that all information no longer needed, needs to be securely shredded, rather than be thrown away in a trash can or recycled. Why do we have to shred everything? It’s simple. A Shred All Policy takes the decision making, questioning, and human error out of the equation. Having employees determine which documents need to be shredded and which ones can be thrown away is too risky a proposition for any business. With all the information that passes through employees’ hands, it’s far too likely that at some point the wrong decision will be made, which could be a mistake that could cost any business thousands, if not more, in fines and reputation. One of the worst-case scenarios for any business to experience is a data breach. Mitigating the risk of a breach should be a goal of all companies and a Shred All Policy does just that by decreasing the exposure created by wrongful decision making. If for no other reason, businesses should be implementing a Shred All Policy for risk reduction alone. As with any training for employees, time and money is needed to enable new procedures and policies to take place. This means that if your shred policy governs only certain types of documents, any time there is a change to the types of documents that are covered by the policy, retraining will be needed to inform employees what the new policy is and what new information needs to be shredded, not to mention regular maintenance of the existing policies in place. Fortunately, a Shred All Policy is straightforward and requires very little training and management. It is easy to maintain – all documents are shredded, govern – employees require very little supervision, and relay to employees – shred documents once they are no longer needed. Making sure your business is compliant with current regulations and future changes can be an exhausting process when it comes to the disposal of confidential information. 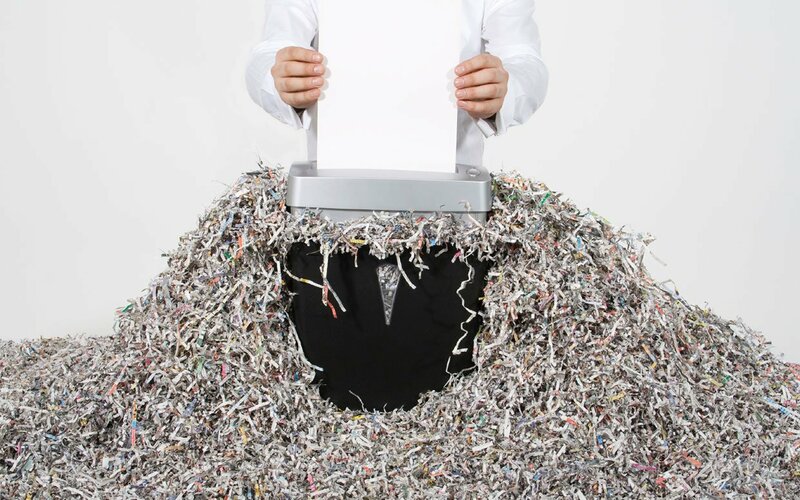 A Shred All Policy relieves any headache, as your employees will be destroying every piece of paper created whether it contains confidential information or not. Having a NAID “AAA” Certified Shredding Company that you can trust is the best solution as businesses implement a Shred All Policy. With recurring shred service, the process remains streamlined and requires very little oversight by internal stakeholders. 1. Secure shred consoles or bins are provided and installed at your office – centrally located for all pertinent employees to use. 2. Employees deposit any paper that is deemed obsolete, trivial, or redundant. 3. A Mobile Shred truck arrives according to the schedule deemed best for your business and shreds all the documents on-site in front of your eyes. 4. A Certificate of Destruction is provided each time service is provided ensuring the chain of custody of all your documents. Just knowing that your company’s confidential information is being protected throughout its life cycle is reassuring, but also take pride that you are doing your part for the environment too. All shredded paper is 100% recycled after it has been shredded, reducing the footprint we all leave behind for future generations. 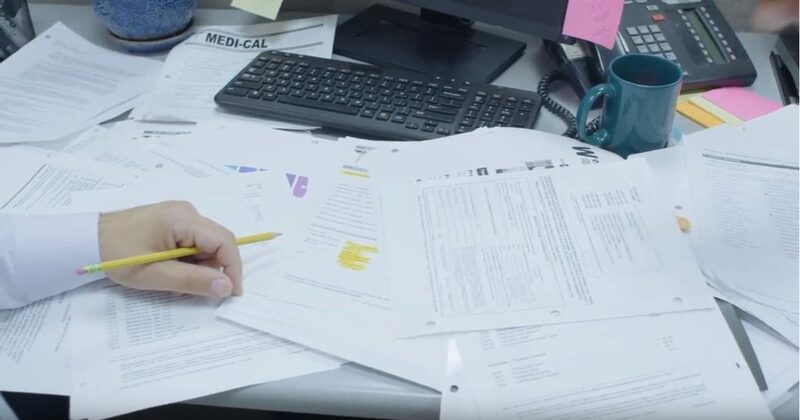 Getting started with a Shred All Policy and Recurring Shred Service is as easy as chatting with us, calling 844.99.SHRED or Requesting a Quote. Take the headache out of document shredding and reach out to us, we’re here to help! ShredMyFiles.com is a secure shredding service specializing in document and hard drive destruction. We work closely with your business to comprehend its needs and customize a shredding schedule that best suits your business.